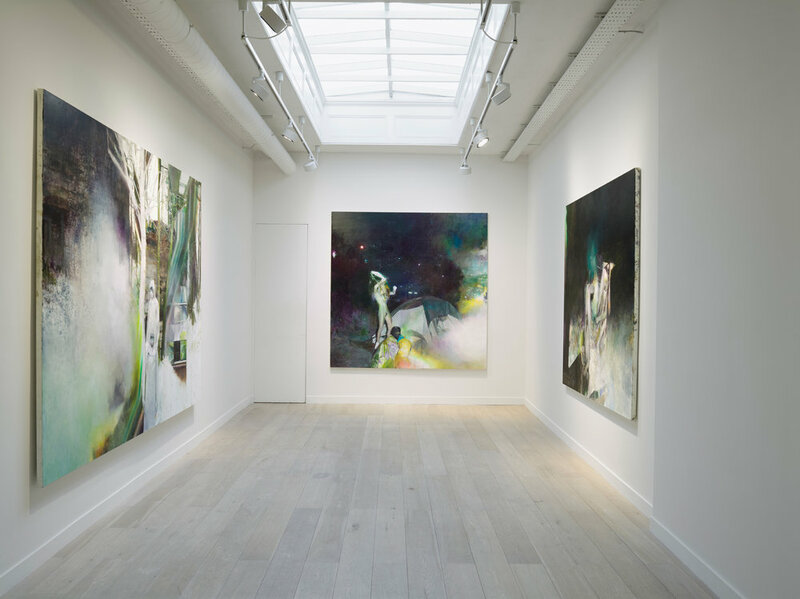 Justin Mortimer, It is Here, installation view, Courtesy Parafin, London. Photo Peter Mallet. Justin Mortimer’s paintings address the present moment. They reflect upon a world in a state of disorder and respond to recent events in the US, Calais, the Ukraine, West Africa, Syria and Afghanistan. 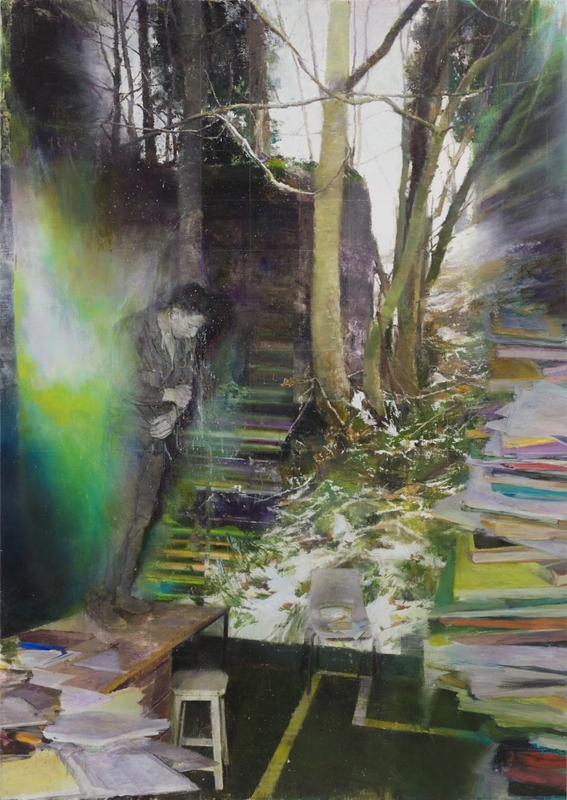 The paintings combine imagery sourced from the internet with archival material from old books and magazines in order to visualize a world in which nothing is stable or certain, echoing the tectonic cracks appearing in the old world order. Could you tell me something about your new solo exhibition It Is Here, at Parafin London last March? A sideways response to all the white noise of anxiety fed by recent geopolitical events. ‘With the ubiquity and homogeneity of [digital photography] painting is reinstating its power to cut through to the marrow of experience.’ Could you tell me more about your idea of painting and why do you choose it as your favorite media? Painting for me holds the strongest presence of the person who actually made it. Beauty and horror, matter and content, figuration and abstraction, in which way are your paintings related to this dichotomies? Negotiating all these feedback loops is probably all that I am attempting to do. How would you present your work? More or less in the manner that I make them. Albeit without the easel and unframed. Where do you make your works? In my studio in Elephant and Castle, an area of South East London. I live at the other end of the Underground line from there: I've never successfully worked at home. What can’t be missing from your worktable? My palette knives. I normally break them (accidentally) when I'm working as they're mostlypoorly made. I do have a couple that have lasted since I started painting 35 years ago though. A collection you wish at least one work of yours was part of? A museum where you’d like to have an exhibition? The market or your need to express? Could you briefly describe one of your latest works? Dead flowers in brackish water. A history of the brain. Histories of Counterinsurgency and Post-colonialism. The NewYork Times. The Guardian. Rereading Ian Banks, Murakami and Margaret Atwood. J G Ballard is a constant friend. I'm always visiting his short stories. Aviation magazines. Do you have reference artists? Artists you’d like to work with? For the magic touch, Degas (my first introduction to 'proper' painting as a boy was through the lens of 19th century French painting). First love: first port of call. Also Guston, Sutherland, Cassat, Darger, Shiele, Scheibitz amongst many others. Not forgetting all the comic artists that created all those strange worlds I inhabited as a boy. In fact if it wasn't for them, I'm not sure I'dever havebecome an artist. Thank you 2000AD. A project, related to art, that you’d like to do? Maybe a record sleeve. And comics of course. If you weren’t an artist, what job would you like? I'd probably be a carpenter. You know, one of those middle-class ones that make their own chisels. Either that or a model maker for special effects... or drawing greeting cards. Let’s imagine a group show. Who would you like to exhibit with? Neo Rauch, Martin Eder, Marlene Dumas, Gert and Uwe Tobias and Rose Wylie. Yes or no to curators? If yes, who would you choose? I have worked well with several and a couple are now good friends. For all the installation views: Courtesy Parafin, London. Photo Peter Mallet.